These photographs of Caherconree were all taken in April and May of 2007. We hope you enjoy the photos. We also have photos of Ireland from January 2004 and photos of Ireland from July 2005 and more photos of Ireland from 2007. 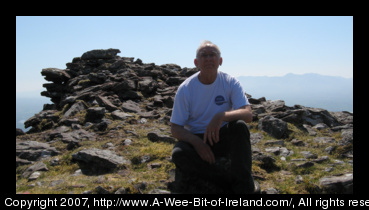 These are photos of Caherconree Mountain and Caherconree promontory fort in County Kerry, Ireland between Aughil and Camp on the Dingle Peninsula. The photo at the left is the photographer exhausted from the climb.